USA Renovations has provided epoxy flooring services not only in the DFW metroplex but also the 48 states. With integrity + results being the focus of the service we provide, we won’t settle for quality other than the best. We manage several crews which allow us to fit your needs, your schedule and your demand. Whether you are a general contractor or direct buyer, we want to work with you and provide the best epoxy flooring service possible. Epoxy Flooring is generally packaged in two parts that are mixed prior to application. The two parts consist of 1) an epoxy resin which is cross-linked with 2) a co-reactant or hardener. Epoxy Flooring is formulated based upon the performance requirements for the end product. When properly catalyzed and applied, epoxies produce a hard, chemical and solvent resistant finish. They are typically used on concrete and steel to give resistance to water, alkali, and acids. It is the specific selection and combination of the epoxy component and the hardener component that determines the final characteristics and suitability of the Epoxy Flooring for a given environment. Slip Resistant – Spillages can often cause employees or customers to slip and fall. With the majority of epoxy floor applications finishing between a .50 – 1.00 slip Coefficient of Friction rating these resinous floors will significantly reduce a slip and fall from occurring. This allows for a much safer environment for employees and customers. 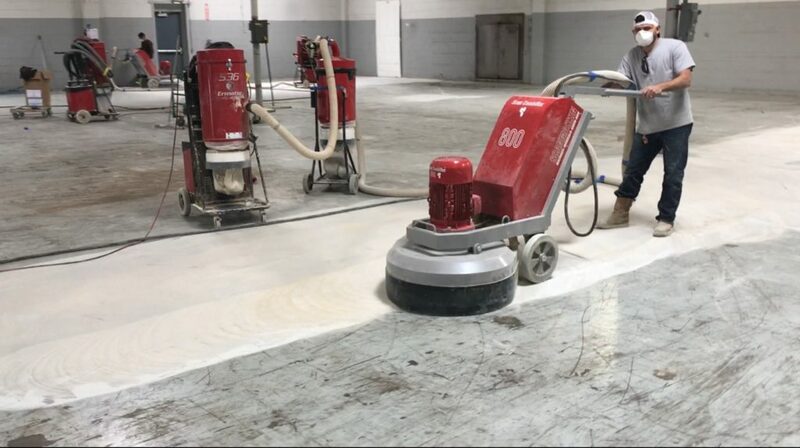 Easy to clean – with a tightly finished epoxy floor there is no longer any porosity for oils like products or chemicals to adhere to the surface unlike that of a concrete surface. With hot water and some cleaning agents, your surface is restored. Chemically resistant – Epoxy coatings can survive continued exposure to chemicals and oils, it is for these reasons many customers in an industrial or retail settings find a resinous floor to be a vital part of the surface that may be exposed to such materials. Application Time – With curing times being relatively low, large spaces can be turned over quickly to reduce down time. With a wide verity of systems, our professionals will design a system that is the best fit for your time frame and level of protection required. Durability – Epoxy floor coatings remain to be one of the most durable surfaces protecting against wear and tear to the concrete substrate. In turn, reduced repair costs are contributed to the restoration of the surface. With several different types of Epoxy Floors such as Polyurethane, Polyaspartic, Epoxy, and Urethane Cement it is important to consult with our professionals. We are certified to install many of the most trusted products on the market today. Costs can significantly fluctuate with one system to the next and require an expert to truly understand what an adequate coating for your project will be. We have the ability to install for all users and industries and will point you in the right direction keeping a budget in mind while staying within the manufacturer warranty standards. It is for these reasons our team of estimators has saved owners thousands with submitting alternative systems that are acceptable for the owner’s use. Let our experts help save you while installing exactly what you need and nothing more! EPOXY FLOORING: WHAT IS CO-EFFICIENT OF FRICTION AND WHY DOES IT MATTER? A safe floor must have high levels of friction at the surface which is measured by a coefficient of friction rating. This measurement declares whether a floor is will have a high or low probability of a slip and fall. The higher the rating of the coefficient of friction, the lower the chances are of slipping: whereas the smaller the rating, the greater the risk. For standard shoes, a concrete floor surface will displace a coefficient that is high enough to predetermine the reasonable probability of slipping. HOW IS AN EPOXY FLOOR INSTALLED? Each epoxy flooring system is different. 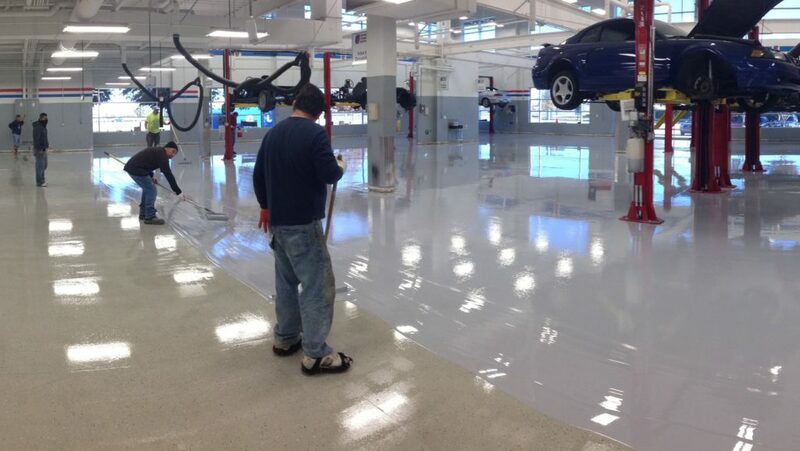 These epoxy flooring applications can range from a metallic epoxy floor for a garage to a high build epoxy with a quartz broadcast for a commercial kitchen. With each of these systems being so different in finish, generally, there are 3 major steps in achieving a well-applied epoxy floor. Using coarse diamond segments which are bonded in a metallic matrix, minor pits, blemishes, light coatings or stains are removed from the floor. Most floors can be prepped with the use of a concrete grinder (seen above) if more aggressive means are required the use of shaver or shot blast process can be utilized. Epoxy primers provide an abundance of benefits for your coating, with some specializing in problems associated with the surface of the concrete itself. To ensure that you achieve the best possible adhesion and endurance of your setting the use of epoxy primers are vital to the epoxy flooring system. During the application of the resinous product, our certified technician will mix both A and B components per the products specification. Once part A and B have been mixed the hardener will begin to run its course. At this point, the team begins back rolling the resin to cover the floor with the thickness specified. Once complete, epoxies produce a hard, chemical and solvent resistant finish. 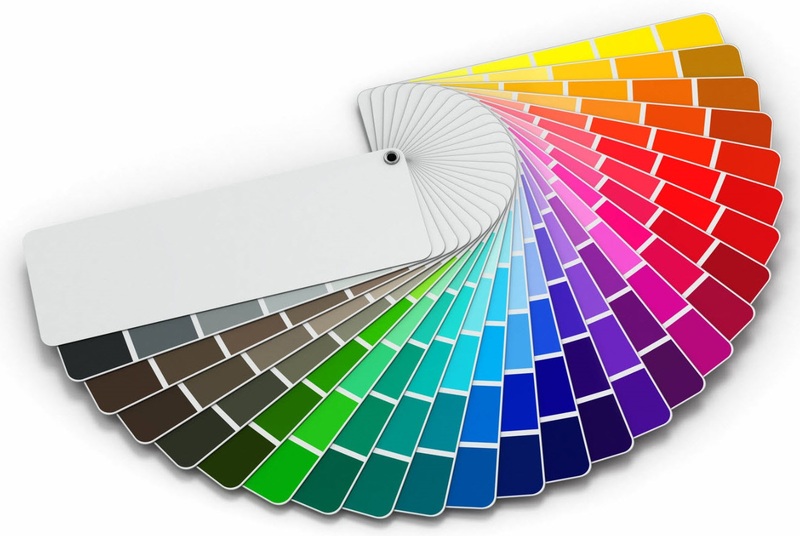 Epoxy is available in standard colors as well as any color code provided by a Sherwin Williams color chart allowing your project to be a truly custom floor. Below is a chart of common colors to choose from. Depending on the finish your floor requires, the use of broadcast or flake may be added to your body coat to improve on either slip coefficient and or aesthetics. Our professionals will provide you with an option that will assist in finding the best floor surface for your project. This product is a form of resin with a hardener and a catalyst that when blended react forming a hard topical surface that protects the concrete from continuous exposure to oils, liquids, and other fluids that may penetrate into the slabs pours. These thin mil polyurethane or poly aspartic coatings are generally the most economical while being designed to withstand wear from the elements such as liquid penetration, vehicle traffic, airplanes, and forklifts. Polyurethane can be finished with Color, Flake, Metallic, or left clear allowing the transparent coating to display the exposed concrete. This is a popular alternative for areas that require an exposed concrete look with the protection of a Polyurethane floor. Not considered an epoxy, Methyl Methacrylate Systems are great when the elements present a challenge during install such as time and climate. The system can be installed at temperatures as low as -22F. This allows them to be installed in active Freezer Rooms which extends the installation season outside of traditional epoxy systems. Methyl Methacrylate (MMA) Flooring and Decking Systems are wear-resistant, impact resistant and can take full traffic and loads within 2 hours of installation allowing minimal downtime for productions/retail applications preventing the need for multiple days of unusable flooring surface. 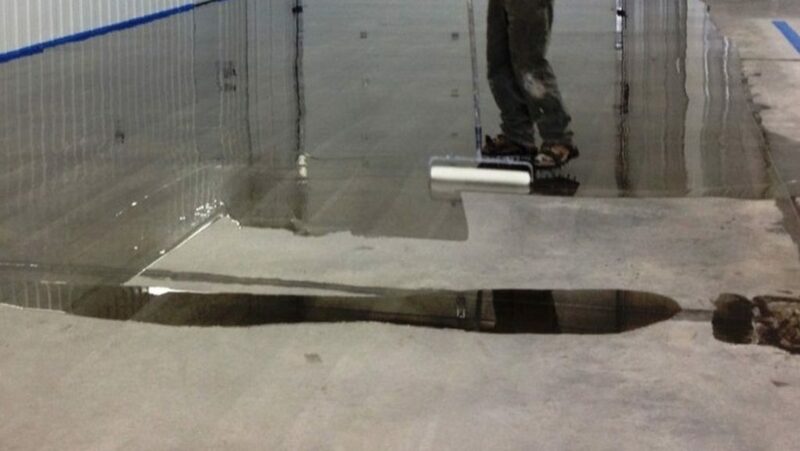 High Build Epoxy is a thicker two-part, durable 100% solids protective epoxy resin floor coating for concrete. High build epoxies are known for their strength and thickness. Most high build resinous applications can be installed with up to 8 mils thick in one coat reducing the time to install several coats to reach the desired thickness. High build epoxies are typically applied in settings such as extremely heavy traffic areas, production areas, and kitchens These systems come standard with color and if required a quartz broadcast allowing for higher slip coefficient. If you would like your floor to remain smooth by omitting a quartz broadcast Aluminum oxide can be added to keep the slip coefficient high. Urethane cement is in a class of highest available protection that can withstand some of the most extreme conditions that cause wear and tear to the surface. This system is a heavy-duty trowel applied urethane cement floor that is several mils think which in most cases are much thicker than epoxy. This allows the system to protect and stand up to steel wheeled carts, harsh chemicals, acids, steam, and heavy impacts. Urethane mortars are also designed to resurface deteriorated concrete in areas which concrete is heavily deteriorated. GET YOUR EPOXY FLOOR TODAY! What are you waiting for? Now that you understand our process a little better and the benefits have been outlined, let’s talk about your space! If you have any additional questions about the epoxy flooring process itself or would like a FREE quote on your floors, contact us today by calling 972-984-4673 or email us at john.clark@usarenovations.com.